I look quite different from when I was a baby, but I currently have about the same amount of hair. Click here to see more embarrassing pictures of me as a child. Click here to read about my politics n' stuff. Also treat yourself to the seaking FAQ! 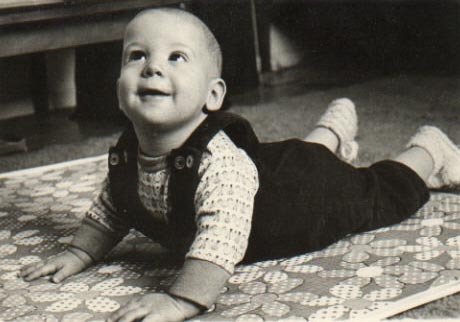 I was born in Port Huron, Michigan, on June 9, 1972. A week later, Nixon's operatives broke into the Democrats' Watergate offices. Coincidence? Perhaps - and perhaps not. In any case, my life was pretty normal for the next several years despite government tumult. 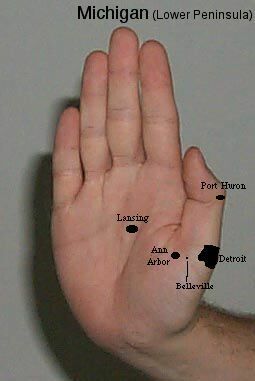 My family lived in PH until I was 11, and we then moved to Belleville, MI (see speck on map). I attended middle and high school in Belleville, and then moved to Ann Arbor to attend the University of Michigan. I started out majoring in Math, and eventually added a second major - Film and Video studies - in which I was more interested. While in college, I met my partner, sarah-marie. After six years there I graduated, and a year after that we headed off to Cedar Falls, Iowa (not pictured). Since then, we've lived in Brunswick, Maine, Cincinnati, Ohio, and are currently residing in Northampton, Massachusetts. I've had various jobs in video, as well as not in video. You can see more on that on my resume. When I'm not working, I like to collect and read comics of various kinds, and I'm a fan of various kinds of music. I also enjoy bicycling - more on that later. This page was created by Sean Kinlin. Last updated 9/20/06.